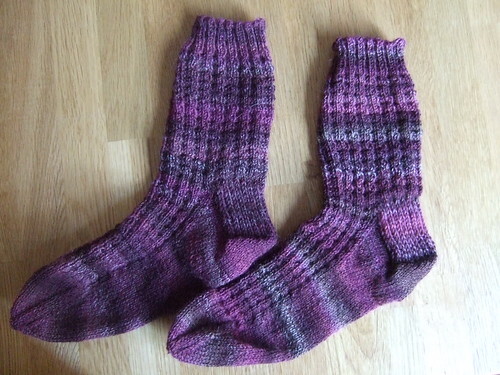 I’ve now finished the blueberry waffle socks…. …so I thought I would use the leftovers to crochet some more sock yarn squares. I started crocheting squares out of oddments of sock yarn about two years ago, and hopefully at some point, when I have enough of them, I will join them to make a blanket. I didn’t write the pattern down when I started making the squares, but fortunately it was fairly easy for me to work out what I did by looking at the completed squares. The squares are worked in back loop double crochet (UK terminology). I started out joining at the end of every round, but then decided it was easier to work in a spiral. Here is a rough pattern for a square. Subsequent Rounds: DC into BL of each stitch to next corner, 3 DC into BL of corner stitch. Continue working around in a spiral working 3 stitches at each corner until square is desired size. I did a total of 10 rounds to make squares of approximately 4″ across. Finish with a slip stitch at end of final round and fasten off. This pattern works particularly well with self striping yarns (noro kureyon sock yarn would be great!) . 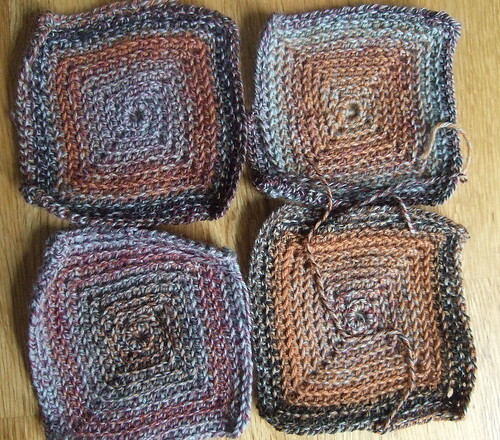 Here are some squares I did with the same ball of trekking yarn. this is brilliant! I would never throw out my leftover sock yarn, but i never have quite enough to make another pair of socks. I am doing this every time i finish a pair of socks! it ought to be fun to see it all accumulate. I can see myself joining the squares for a scarf or a small blanket or whatever! I keep drooling over sock yarns even though I don’t knit and now you have gone and given me a pattern to use with it. I don’t know whether to thank you or not since I don’t need to add to my stash right now, lol. I vote for another round yoke cardi. I made one using your suggestions in your tutorial and it was beautiful. My daughter requested pink mohair (don’t ask…) and I swatched and did what you suggested and it came out… perfect! I’m still stunned. Louise, I would love to see a photo of your cardigan. I’m glad it turned out well. Very cool way to use up the ends of sock yarn!! Thanks! Just to let you know, I used your pattern to make a scarf to my boyfriens and it’s great! On my blog(Catherine-dans-les-nuages.blogspot.com) I linked yours as the reference for the pattern and idea.